Good stuff. I have flown to Montana with two rolling duffles carrying camping and fishing gear. I’ve saved a bunch of cash camping in the summer. I’ve stayed out of the National parks to have more flexibility since a reservation isn’t needed most state campgrounds. Maybe camping in Yellowstone in the spring and fall is a less crowded time to go. Thanks for the inspiration! Yes, camping is a great option, too! If you camp in Yellowstone, even in the spring or fall, be careful about grizzly bears. It’s been a few years since I’ve camped in Y-stone, but you might want to check to make sure the particular campground you want to use allows tents. I remember a few times when Madison Campground would close down a loop or two to tents because of bear concerns. Thanks for your comment! What duffel did you get for $175? Are there any other bags you would recommend? It seems you pay a premium for most fly fishing duffels and suitcases, but I’m sure many other normal brands will do the job just fine. I got the Expedition Drop-Bottom Rolling Duffel (Eddie Bauer). It retails for $220, but it was on sale then for $175. I just checked EB’s website, and it’s on sale for $137 at the moment!!! I don’t know how long that will last. You’re right, Cameron, you will pay a premium for duffels that have a popular fly flishing brand name. EB can be that way, too, except that they often have great sales. Otherwise, any normal brand will do–just so it’s long enough for a rod tube. That’s what I like about the EB duffel. My number one tip is to bypass the guides and buy several books on fishing in Montana. Guides are great but to this tightwad, expensive especially as I generally fish on my own. Now I’m not averse to hiring a guide having done so on many occasions but the cost plus 20% tip puts Montana guides into a different price point where frankly I’m not sure I’m getting good value for money. So what to do, search the internet for information and buy a couple of books. I have books by Nate Swebber and Richard Parks and have just ordered Fly Fishing the Greater Yellowstone Backcountry by Bruce Staples for my Summer 2019 visit to Montana. 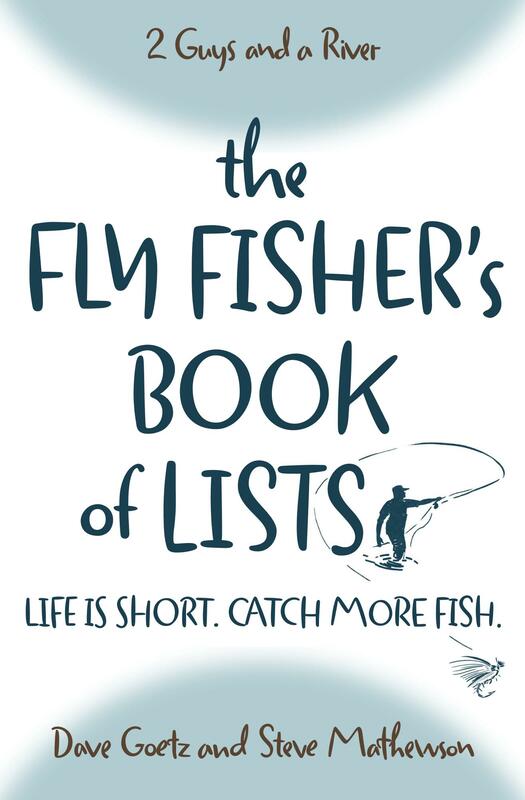 Naturally I wouldn’t be without The Fly Fishers Book of Lists when heading out west! In addition visit a local fly shop or shops, there are some great shops in the Bozeman, Yellowstone area. You can buy a lot of fly fishing stuff for the cost of a guide. Thanks, Brian, for your perspective. Yes, guided trips are expensive. We couldn’t afford them if we weren’t able to split the cost. Good fly fishing books are worth their weight in good, too. I haven’t read the Bruce Staples book. I may have to check it out. Have a great trip to Montana this summer!